I don't think there is another bake in the entire universe that has as many names as this one. For some, it is a Fridge Cake. For others, a biscuit cake. All through my childhood we called it 'Choccy Wokky Do-Dah'. My friend calls her version 'My Easy-Peasy Cake for People Who Don't Bake' Cake. And it goes by the name 'Tiffin' in some circles and has even been referred to as 'Cold Dog Biscuits' (I think I prefer our childhood name just a teensy bit more). But the common thread is that this is a non-bake, cake-like creation comprising of crushed biscuits, syrup, chocolate and dried fruit. Marshmallows, Rice Krispies, Maltesers, meringue and all manner of other additions can also be stirred in. So good in fact, Prince William requested it as his wedding cake. (Well, second wedding cake. The first was a far more fancy, traditional affair). I baked this biscuit cake/choccy woky do-dah/tiffin/fridge cake (delete as applicable) for Andrew's birthday a few weeks back. After posing the question: 'And exactly what cake shall I bake for your birthday this year, my love?' we spent the next thirty minutes ruling out Andrew's first request: a 'wine cake'. I have since discovered that both Martha Stewart and Smitten Kitchen have recipes for wine cake. Who'd have thought it. Anyways, this version of the Cake-With-Too-Many-Names is an elegant, adult-only boozy affair with an extremely generous helping of kirsch. 2. Place the Rich Tea in a food bag and bang the biscuits to crush them into gravel sized pieces with a rolling pin. Ever so satisfying. 4. Stir in the biscuits and cherries, including any left over kirsch. 5. Spoon the mixture into the square tin. Melt the remainder of the chocolate and pour over the biscuit base. Decorate the top with a handful of cherries and pop in the fridge for a few hours. 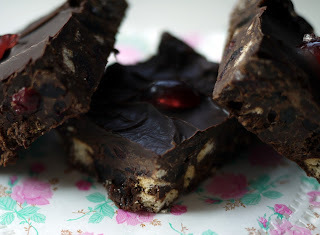 And because of Prince William has given his stamp of approval to the Cake-With-Too-Many-Names I'm entering this crackin' chocolate creation in this month's We Should Cocoa blogging challenge, hosted by Lucy from The KitchenMaid with the theme: 'Fame'. Lucy is calling for famous chocolate recipes. 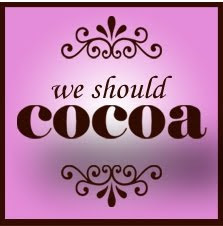 We Should Cocoa was created by Chele at Chocolate Teapot and Choclette of Chocolate Log Blog. Delia Smith calls her 'grown-up' version a chocolate-crunch torte! I've always known it as refrigerator cake or tiffin. Whatever you call it, it's ace! Mmmmmmm tiffin (yup, I'm in that camp). It always reminds me of my Great Auntie 'Manda. Happy belated birthday to Andrew! It's tiffin in our family, and I love the addition of some alcohol. I LOVE chocolate biscuit cake (that's what we call it in the little loaf household). My Mum used to make it for us in a rabbit shaped mould surrounded by green jelly for grass - the perfect birthday party cake! I still have an extremely soft spot for it now - in fact I may have to make some for Easter now I've seen this! 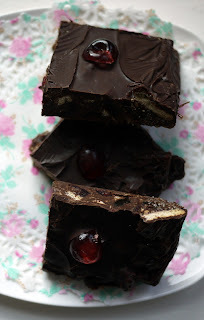 Ps red wine chocolate cake is definitely a thing and really yummy, highly recommend trying it! It looks delicious. 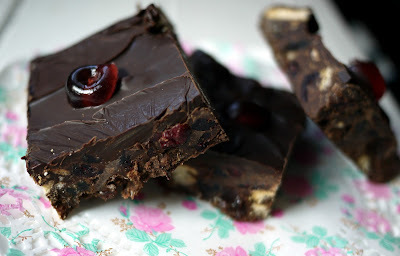 I have never made a no-bake cake of any kind before so must try this one - what a yummy way to save on electricity !! I've always known this cake as simply refrigerator cake. But I, for one, don't care what it's called as long as it's yummy!